Looking to increase efficiency and retention? This tool is simpler than you think. If you’re like almost 100% of Americans, you already use this popular communication tool in your everyday life. So why aren’t you using it in business? If you guessed text messaging, then DING DING DING – you’re the winner! What’s your prize? Well, it’s the great results that you’ll have once you implement this into your dealership, of course. That’s right – texting is becoming increasingly popular to use in business, and can truly help your car dealership. How exactly can utilizing texting in this way help you? The usual process for your sales, service, and parts departments when following up with a scheduled or current client is probably to make outbound calls to confirm appointments or information. Most of these probably end up reaching the client’s voicemail instead of the actual client. When you can send a text message in lieu of leaving a message on their mobile phone (which they may not even have a voicemail set up for), you can send the text and move on to the next! No more wasting time with countless outbound calls just to remind about appointments – you can now schedule texts or simply type off a quick message reminding someone about their appointment to come in or letting them know when their car is ready to pick up from a service appointment! With populated responses, you don’t even have to necessarily be near your computer or phone to text the client – you can set them up ahead of time when you have extra time to dedicate and do it for you when needed. Transferring phone calls between departments may be difficult if there is no one available in the service department at the moment that a caller needs to speak to them. The caller must be put on hold or, even worse, transferred to a voicemail for someone to get back to them. With a great texting program, you can seamlessly transfer a text to the correct person or department that can handle the customer’s question or inquiry without them even know that they are speaking to possibly different people all within the same text exchange. It is still a best practice to answer a text in a timely manner of a few minutes, but it gives much more leeway than a regular telephone conversation would. When making outbound follow-up calls, it is easy to miss people who work regular office hours or may be busy and not pick up their phone. But the average response time to a text message is just 3 minutes – people can easily access their phone to read a text even when they may be busy in a business meeting or somewhere where they cannot necessarily speak on the phone but can type up a quick text message. Although you should never be missing inbound calls in your dealership, text messaging ensures that you really will never have a slip up where you miss a customer or potential customer who is trying to engage with you. When you have a buffer of time before you have to answer someone (it doesn’t have to be immediately such as a phone call does), it makes it easier to get to more people. You can also communicate with multiple people at once when you are text messaging – especially if your texting program allows you to communicate via desktop or mobile, and from many different devices that anyone who would speak to customers has access to. Where is the miscommunication excuse now? While you can keep call recordings from your tracking telephone numbers, with text messaging you easily have a text thread of past messages and conversations to keep handy if needed in the future. These also take up less space to save than audio files would. Curious to learn more about how texting can help your dealership gain and retain more customers? 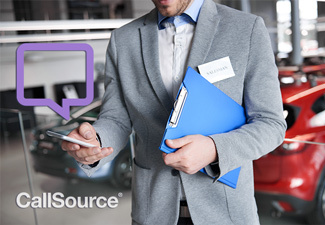 Talk to a CallSource Representative now to hear how more about our texting platform.